A black and white negative of the front of 700 Brock Street South in Whitby, Ontario. View is from the street looking north. This house is located on the south-west corner of Brock Street South and Trent Street West. William Davidson was born near Guelph on 2 December 1889 and came to Whitby to assist in the construction of Ontario Hospital in 1913. He was an engineer responsible for the building of steam installations at the hospital. From 1917 to 1962 he operated an automobile dealership in Whitby. Davidson was a member of council in 1924, 1929-1935, 1944, and 1960-1964. He was deputy reeve in 1936-1937 and mayor from 1947-1949. In 1945, he revived the Whitby Chamber of Commerce and was chairman of the Public Library Board and member of the Public Utilities Commission. He received the Peter Perry award in 1957. William married Emily Jane Swain (1890-1976) on 23 December 1913 in Holland Landing, Ontario. They had two children: Edna and James Thomas. Mr.Davidson died at Oshawa on 26 October 1965 and is buried at Mount Lawn Cemetery, Whitby. 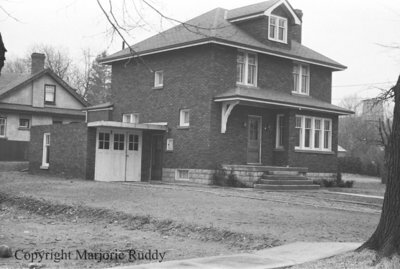 700 Brock Street South, March 23, 1938 , Marjorie Ruddy. Whitby Archives A2013_040_971B.